I became inspired to write this essay one night as I was watching DANCING WITH THE STARS. I usually watch some dances as a way to unwind from my day. I was thinking what a commanding presence The Troupe has become on the show. I decided to give them their due. A definition of a Dancing Troupe is simply a group of dancers dancing together. However, A TRIBUTE TO A TROUPE encompasses a far-reaching definition. The Troupe has evolved over the seasons into an integral, important, incredible group! The Troupe first appeared in Season 12. They played a more back-up role in their first seasons. But, Read more..
PureDWTS Season 18 Food For Thought & Poll: Possible New Pro…? So my friend Amanda over at PureSYTYCD shot me a tweet this afternoon – she gets to go to the SYTYCD live show tonight in Atlanta, and she happened to run into some of the cast at the mall earlier today. She apparently got to talk to Du-Shaunt “Fik-Shun” Stegall (co-winner of the most recent season of SYTYCD), and according to him, someone from his season “will be on DWTS next season”. He didn’t specify who, and he didn’t specify whether they’d be a pro or in the troupe – but there were 4 ballroom dancers on SYTYCD this season, so I figure he must be referring to one of them (although stranger things have happened…look at Tyne). Yes, it’s probably a bit early for anyone to know for sure whether they’ll be on the show next season, but it did get me thinking: maybe TPTB are already scouting out new talent for next season, and they want to go fishing in the SYTYCD pool once more…so it might be possible that they’ve at least been “in talks” with some of the ballroom dancers from season 10 of SYTYCD about coming over to DWTS. If so…who could it be? The four possible choices are Brittany Cherry, Jenna Johnson, Alan Bersten, and Paul Karmiryan. Both Brittany & Jenna are part of the VIBE family that gave us Lindsay & Witney, so I’m guessing that by extension, they’ve also worked with Mark on more than one occasion. Both ladies have also appeared in guest dance numbers on DWTS before (see below – Brittany’s the brunette on the left, Jenna’s the one on the right). I don’t know quite as much about the guys – I know Paul actually won the Armenian version of SYTYCD a few years back and lives in California, and Alan comes from a dance family (his older brother also auditioned for SYTYCD, but the judges chose Alan) and lives in Minnesota. If this little nugget of info is true, who do you guys think will be joining us on DWTS next season? I’m personally leaning towards Jenna – she’s the VIBE connection, she went pretty far on SYTYCD, and she seems to have the same “big” personality on the floor that we see from Witney. Definite troupe material, IMO. Not sure I’d want any of these 4 to proceed straight to pro, but I think any of them would make a decent addition to the troupe. What do you guys think? Do you think we’ll be seeing any of these dancers gracing the DWTS floor next year? So, it’s official. Dancing pros Henry Byalikov, Sasha Farber, Sharna Burgess and Emma Slater will all be returning for the new All Star Season of Dancing With The Stars according to their twitter and Facebook accounts. Oksana Dmytrenko hasn’t confirmed, but, I think she’s returning as well being nothing has been said otherwise (let us know if you know more?). Sadly, Kiki Nyemchek will not be returning. It’s going to be interesting to see who fills his spot. Any ideas or wishes? I’d like to suggest Jonathan Platero! More on that in a sec. In other updates on the Troupe currently. Henry just got back from Australia. He helped with the new season of “Dance Academy ABC” due to air in the middle of 2013. Things are really starting to happen for this fan loving Troupe member. It’s going to be a big year for him. Don’t forget how he helped and is starring in one of the most anticipated movies of 2012 to be released soon “The Great Gatsby”. Oksana has had a busy summer doing several black tie events. Below she danced a rumba with “So You Think You Can Dance” pro Jonathan Platero to Beyonce’s Sweet Dreams at a recent event. Incredible. Can you see why I think he might be a good replacement for Kiki? 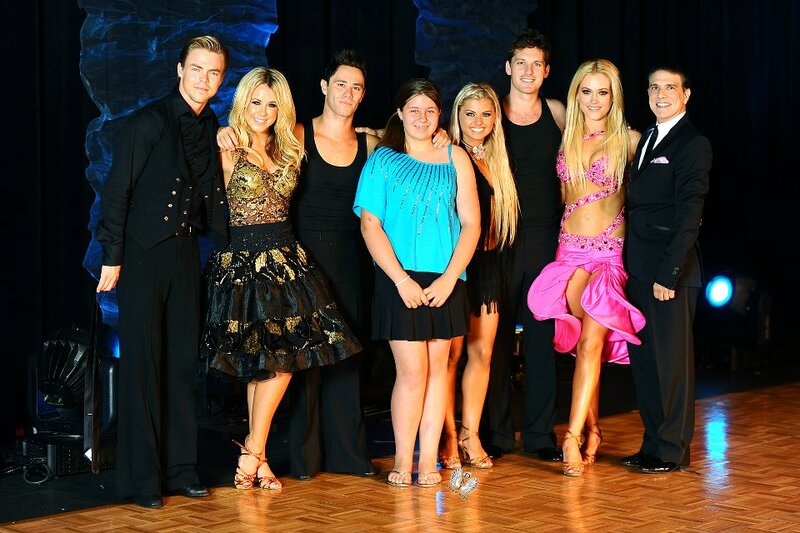 You can also watch Oksana dance at a recent showing with Derek Hough at Pure Derek Hough. They are way steamy and so powerful. 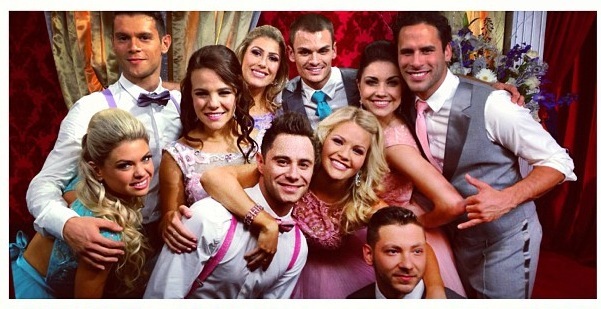 And then there is Sasha Farber and girlfriend, Emma Slater. These past weeks, the two have been lighting up India in their version of Dancing With The Stars. According to Sasha, the episode with them airs this weekend. Check out this cool coverage of them. It’s fun to see Dancing With The Stars catching on in so many countries and how it’s different for the way they compete too. And, last but, not least, we can’t forget about Sharna Burgess. You can see all of our recent updates with her here. She recaps her summer with us at this link. What a star as recently she also helped kids on skid row have a fun day and get them ready to go back to school. Stay tuned! According to twitter, Sharna will be filming her first commercial. I’ll be curious to see what this is all about. As you might have read in a previous posting, Dancing With The Stars troupe member, Henry Byalikov has a dancing role in one of the most highly anticipated movies of 2012, “The Great Gatsby“. Henry also taught the leads Leonardo Di Caprio, Tobey Maguire, and Carey Mulligan how to dance for the movie. Below is a new interview he did for it on The Morning Show. They also go through his whole career so far full of major accomplishments. Check out how he’s been working on the new lead for “Strictly Ballroom: The Musical” as well. FASCINATING! A MUST SEE! And let’s hope he gets the new lead!! He’d be perfect!! “The Great Gatsby” has a December 25th release date. I plan to see this, do you? I was a big fan of the first movie with Robert Redford and Mia Farrow. Below you can view the trailer. Thanks to @Elara38 for the help with this post!! Also, the Sheboygan Press has a slew of pictures of Dancing With The Stars Season 14 Champs, Donald and Peta, answering questions for the press and Peta throws the first pitch in the softball game. Below are just a couple of them. You can see many more in a fun gallery at the link. Donald and Peta thanked their fans for voting for them. Peta also admitted that she’s been swept up in the “green and gold spirit”. Here is more in a take from the WAOW ABC Channel 9. Note how Donald’s team won the game. “They had everything to do with it and I couldn’t have done it without them. I tip my hat off to the fans. Me and Peta did our part. At the end of the day, it was up to the fans to win it all,” Driver said. His dancing partner Peta Murgatroyd says she can’t help but get swept up in the green and gold spirit. “It’s out of this world. I haven’t seen anything like this before. It’s crazy. It feels so good to have the support of Packer Nation and Wisconsin,” Murgatroyd said. “I knew Packer Nation would come through,” Bartz said. Some fans say they’ve never watched Dancing with the Stars before. But because of Driver, they not only tuned in, but voted. “When a hometown favorite wins it and brings it home, that’s huge,” Josh Marnocha from Seymour said. Peta even threw out the first pitch, right down the middle. And as for the game? Driver can add a softball title to his trophy case. The offense took down the defense 22-10. And below is a Fox 11 news TV report…. If any of you were at these events and have a story to share, more pictures, or video coverage, be sure to let us know in the comments section. What a great weekend for them all! !